Happy birthday Florence Parry Heide (Princess Hyacinth), Uri Shulevitz (Snow), and Mary Kay Kroeger (Paperboy). It’s the birth date of Laura Richards (1850-1943, Captain January), Edna Barth (1900-1981, Shamrocks, Harps and Shillelaghs), and Eric Sloane (1905-1985, A Reverence for Wood). Also born on this day was the poet Henry Wadsworth Longfellow (1807-1882). Read Paul Revere's Ride by Longfellow, illustrated by Ted Rand, and The Midnight Ride of Paul Revere, illustrated by Christopher Bing. It’s No Brainer Day. 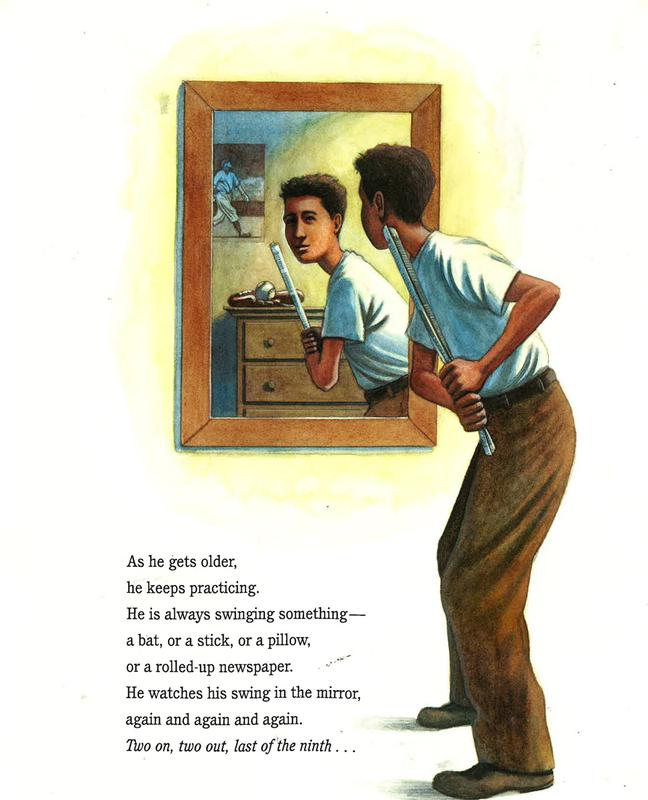 Read The Great Brain by John Fitzgerald, illustrated by Mercer Mayer. I grew up in the state of Indiana, where basketball stood as the supreme sport, and moved to a city Boston, where baseball reigns. Consequently, like most Bostonians, I know that today the Red Sox play their first game in spring training. So I thought I would use this occasion to talk about one of my favorite picture book creators, Matt Tavares. After the book’s epigraph, a young Ted Williams, in San Diego, California, takes the stage. He dreams of being an important baseball player and does push-ups on his fingertips to strengthen his scrawny body. Before he even graduates from high school, he plays for the minor league San Diego Padres. Then in December of 1937, nineteen-year-old Ted Williams signs up with the Boston Red Sox. Matt Tavares shows Ted Williams hitting home runs, leaping and skipping around the bases. His determination, his grit, and his drive to batting perfection take up the majority of the text. But readers also see Ted Williams as a patriot, someone who interrupted his baseball career to fly airplanes in World War II and Korea, where he had to jump out of an exploding airplane to save his life. Matt captures his subject matter brilliantly in the book as well as the excitement and action of the baseball field. In his author’s note he rounds out the picture of Ted Williams that he gained while researching the book. 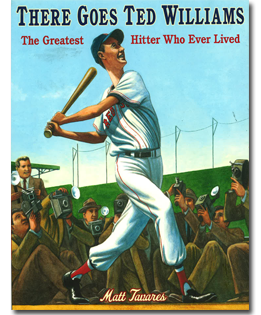 By the end, every young reader will know how Ted Williams achieved his dream of becoming the greatest hitter who ever lived. Originally posted February 27, 2014. Updated for .